A few shot of yesterday. Both were raws shot in PEF format which I then tonemapped in LuminanceHDR with a Mantiuk processor to get that old, quaint, feeling. Levels and curves, as well as slight sharpening was done in DigiKam's Showfoto while the framing was done in the GIMP. It was very hard to exclude modernisms like parked cars and some can still be seen here and there. Regretfully, this is unavoidable nowadays. Nevertheless, I hope this succeeds in conveying a little early 19th century feeling. They look like Currier and Ives prints. The second one is my favorite. I think you got the feel that you were going after. Well done. Great composition and perfect exposure, Very nice! Both are beautiful. I love the second one a bit more - there is something in the sightly curved, snow-covered, lamp-lined street on the left that invites to walk towards the church... maybe cross the bridge... For me, it creates one of these "I wish I were there" moments. Very nice shots. I am favoring the composition of the second shot. Thanks for all of your responses! This was actually a very cloudy and grey day so I waited until around 4-ish when the street lighting comes on. 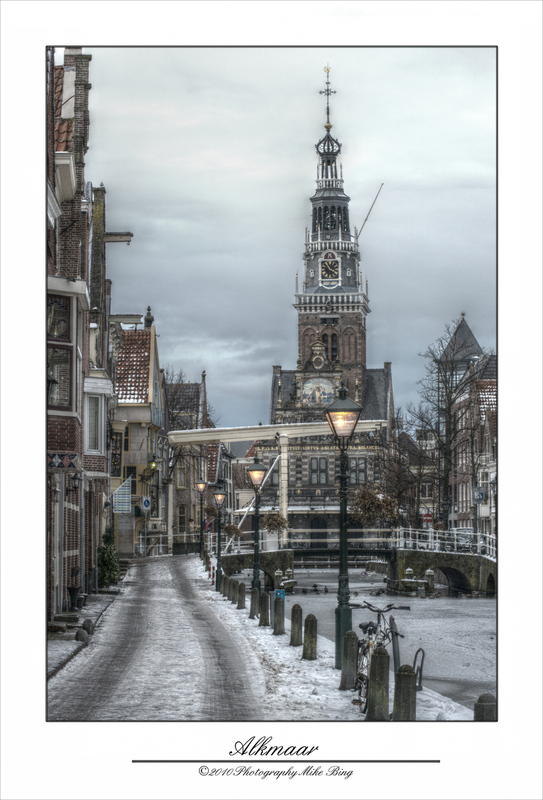 The building at the end is not a church, it is a weighing-house or "Waagtoren" in Dutch. In the case of Alkmaar, it is the cheeses at the world-famous cheese-market that are still being weighed every Friday in the summer season although no real transactions take place anymore - it has been turned into a tourist show, sadly enough. 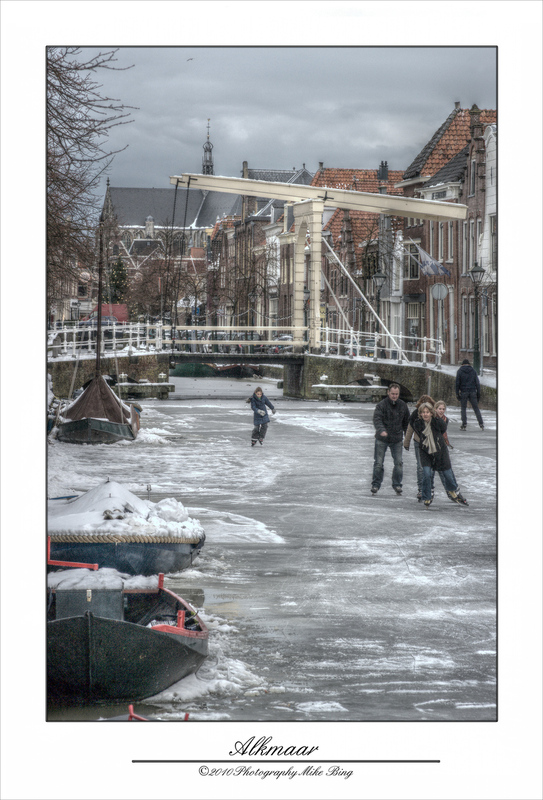 The family skating and having fun on the now-frozen canal actually live in one of the houses directly adjacent. In summer they have their little boat and in winter they step straight out of their frontdoor onto the ice. "A weigh house or weighing house is a building at or within which goods, and the like, are weighed. Most of these buildings were built before 1800, prior to the establishment of international standards for weights. As public control of the weight of goods was very important, they were run by local authorities who would also use them for the levying of taxes on goods transported through or sold within the city. Therefore, weigh houses would often be near a market square or town centre. Between 1550 and about 1690 people accused of witchcraft were at times brought to a weigh house in order to be subjected to a "witch test". If a person was found to be lighter than a set weight, he or she was deemed guilty. This is similar to the use of a ducking stool. Weigh houses were especially common in the Netherlands, Germany, where they are called waag and waage respectively (both meaning "scale") and Poland (smatruz, in Krakow and Poznan). Outside the Netherlands and Germany the public weighing usually didn't take place in a special building, but in a town hall, guild hall, courthouse, or the like." "Alkmaar is a municipality and a city in the Netherlands, in the province of Noord Holland. Alkmaar is well-known for its traditional cheese market. For tourists, it is a popular cultural destination. The earliest mention of the name Alkmaar is in a 10th-century document. As the village grew into a town, it was granted city rights in 1254. The oldest part of Alkmaar lies on an ancient sand bank that afforded some protection from the sea during medieval times. Even so, it is only a couple of metres above the surrounding region, which consists of some of the oldest polders in existence. Alkmaar's cheese market at the Waagplein, is one of the country's most popular tourist attractions. The cheese market traditionally takes place on the first Friday in April and the last market of the season is the first Friday in September. Every Friday morning (10.00–12.30 a.m.) the Waagplein is the backdrop for this traditional cheesemarket. After the old-fashioned way of the hand clap, traders and carriers will weigh the cheeses. It is one of only four traditional Dutch cheese markets still in existence. The traditional fare of this cheese market are those cheeses made in the local area, as opposed to the well-known brands of Dutch cheeses, i.e. Edam cheese and Gouda cheese. It is not actually possible to buy cheese at the market itself, which is really only a demonstration of how this merchants' market operated in times gone by. However, the demonstration, which takes place in front of the medieval weighing house, is surrounded by many specialized stalls where it is possible to buy all kinds of cheese (and non-cheese) related products. The Waag is home to the local tourist office and a cheese museum. These shots are like a time machine. Not only subjects, but the color and texture send you back in time. Wonderful job.